You know from my Sausage on Salad post that I have hot Italian sausage in stock. Today, I was debating lunch once again. I am feeling better (thanks everyone), but I have lots of errands to run today so this still had to be a pretty quick meal. 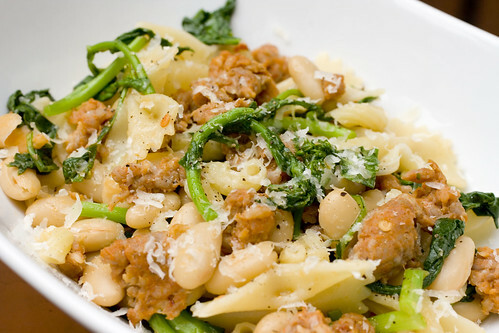 Luckily, I have fresh broccoli rabe from the farmer’s market and I love it with sausage. 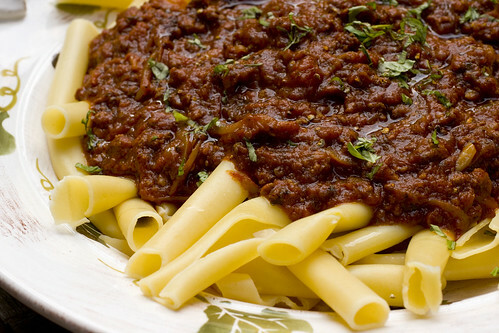 It’s a pretty common pasta to see at Italian restaurants, but here’s a fast and easy, healthier rendition. For lunch today, I scrounged through the fridge and found three leftovers: the sauce from some spicy dduk bok-kee from Korean Grandma; tomato chutney (sweet & tangy from ginger and vinegar) I made to top some tilapia last Sunday; and plain macaroni I boiled a few days ago for my inside-out meatball experiment (which didn’t go very well). I combined it all and added some garlic and mozzarella. It was a delicious lunch. However, I broke the cardinal rule and had pasta again for dinner! This time I went all out with home-made ravioli. I picked up some spicy Italian sausage from Garden of Eden along with some washed spinach leaves. I didn’t write down the exact recipe, so here goes my best guess (particularly for the filling). In other words, this is a completely unrefined recipe. This is enough for three portions. In a broad mixing bowl , pour in 2 cups of flour and create a well, into which crack two eggs. With a fork, wisk the eggs, slowly widening your mixing bringing in the flour, until the mixture is getting dry (about one minute). Add 1 tbsp. olive oil, and warm water as necessary to just bring dough together. Continue turning and kneeding dough for three minutes, a little flour may be necessary to keep it from sticking. Over time it will not stick. Once basically smooth, flatten into a round and place on your counter, under the bowl you used to mix the flour and eggs. Leave it for at least 15 minutes– this is the perfect time to make the filling (see below). Once the dough has rested, cut it in half with a large pastry scraper (Jess likes the OXO pastry scraper ), and wrap half in plastic wrap. Flatten the dough with your hand until it’s less than an inch deep. In most cases you do not need a special machine for this, but rolling ravioli dough by hand is insane. We use a pasta/noodle machine (the common Imperia model ). Standard approach here: roll the dough through on the widest setting (#1 on ours); dust the dough with flour and brush (with a pastry brush ) the extra off, then fold it over itself in half until, when turned 90 degrees, it will fit back through the machine’s width. Repeat this three times, turning 90 degrees each time. Remember to use a little flour between each fold, but not too much. Then begin reducing the machine’s settings, one step at a time, passing the dough through each time, until you get to the thinnest setting. By this time the dough is unwieldy! I tend to ribbon fold the dough on itself to help manage it while feeding it. Kind of like an S-shape. Finally lay out the dough, so that half of the length is flat (I keep the other half folded, but you could cut it off and reserve it). Quadrant off 2″ square sections and put a 1 tsp. dollop of the filling into each square. /> Carol got us) the edges of each square. Then cover the filling/bottom layer with the other half of the dough that was folded off to the side. Carefully push all the air out and try to seal the dough flat. Cut the ravioli squares with a pizza wheel . Scrape them off the counter with your pastry scraper, and place them on a baking sheet and cover with a towel. If they’re a bit wet, dust with some bench flour. We’ll talk about final cooking below. In a large skillet, sautee the sausage over medium heat in a tbsp of extra virgin olive oil with the diced garlic. Break up the sausage as it cooks into the smallest pieces possible. When done, reserve in a bowl on the side. In the same skillet (no need to wash), cook the spinach with the basil and black pepper. No additional oil or water is necessary, just cook over medium heat and cover the pan, cook about four minutes. Chop the cooked spinach into a dice and put in the bowl with sausage. In salted, rapidly boiling water, cook ravioli in portions (about 4-6 at at time), for one minute, then reserve in a colander. In the same skillet where the filling was prepared, still uncleaned, sautee over medium-high heat, the garlic in the olive oil. Then deglaze with white wine. Add the tomatoes and chicken stock and bring to heat; then stir in the corn starch as a slurry (add enough cold water to liquify starch). Finally stir in ravioli and bring back to temperature and serve. Check out Flickr for more pictures of the ravioli.